The Manfrotto MA 300 panoramic head is sturdy and of good quality. It can allow adjusting the angle of rotation down to10 degrees by a very convenient radial click-stop device. 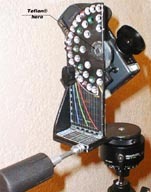 It is fully efficient when shooting photographs for low to medium resolution panoramas (say less than 4000 pixels wide). It is also one of the best tool for shooting huge architectural image with ultra-high definition such as those that Max Lyons or J.Brian Caldwell have presented. Panorama of very high resolution (e.g. 15600 * 7800 pixels without lens converter on a CP990) can also be constructed from 60 pictures (6 rows of 12). One could imagine to make even much higher resolution panorama if necessary...at the cost of very long processing time. However and unfortunately, MA300 is not as fully accurate as it should be if it had been designed for fully automatic stiching from a PTools reference master script made once for all. I fully acknowledge that MA300 was not intended to accept this challenge anyhow. Among others, Andreas Schoemann has presented ways to get close to perfection but he must admit some necessary postprocessing that is due in part to horizontal positionning errors of the MA300 that hampers a perfect repetition. I have experienced that in extreme cases, errors as high as 0.47 degrees can be (willfully or not) created. That corresponds to horizontal positionning error of 14 pixels while stitching two adjacent images originally shot with CP990 and WC-E24 at the widest zoom setting. However, the average observed positionning error is somewhere between 0.05 to 0.1 degrees, This error is great enough to create a need for specific simple postprocessing. As stitching should not depend on a lotery, then the MA300 angular positionning needs to be improved even further than its praised performance, but how? ... Manfrotto.......Are you listening ? What is inside a MA300? By carefully dismounting the device, one can see that four main quasi-cylindrical components, a roller bearing, a screw, a "Belleville" spring-washer and a lock-nut make the core of the MA300. A locking screw and a ball tipped screw complete the system. Plenty of lubrication is also applied on most of the internal surfaces. Four main cylindrical parts and a main screw, a washer, a lock nut, a locking screw, a roller-bearing, a ball tipped screw, etc. This simplified drawing shows the different functional components of the MA300. On the bottom right view (A), the locking screw is removed. (1) and (3) are free to move with respect to each other. This single element rotates on and inside the other (grey) part. 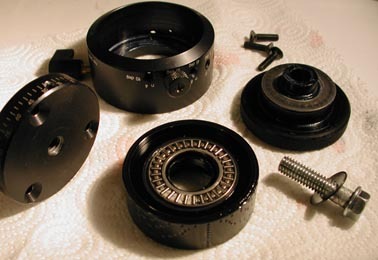 A roller bearing make the motion slack-free when the screw and the spring-washer press on (2) by screwing (3) and finally the counter-nut from the top side. Radial slack#1 and slack#4 are -by far- the principal factor to the looseness problem. Longitudinal slack#3 is easy to feel when the locking-scew is untightened or removed: just push-pull the top from the barrel. It has almost no impact on the performance of the MA300 device and shall be easy to adjust for the best result: Just position the spring loaded ball-tipped scew FIRST in ANY groove and ONLY THEN tighten the locking srew in a SECOND step. Slack #2 would have no effect if it was equally distributed around the circumference..That is not the case: depending on initial conditions, it is always unevenly (but not randomly) distributed. This has some minor side effects. In particular the pressure from the ball of the detent click-screw is not equal all around the circumference. It even eventually happens that the screw slightly scratches the barrel on a portion of the revolution. What should be corrected for perfect positioning?  slack#4 to be a gap of 0.13 millimeter wide. Both can be cummulated in the worse case. The resulting errors is an angle which vertex is located at the groove on the inner barrel where the ball of the detent-screw is stuck in. The summed slack is the opposite side of the isosceles triangle that has sides of about 30 millimeters. Trigonometry being used, the very maximum angle positionning error is then computed at about 0,5 degree. The slack#2 is of irregular value around the inner barrel as was stated before (it is easy to check this without any dismountig of the MA300 at all with the help of a gauge set). This irregularity shall be self-corrected as a side effect of the following step! A Teflon® tape that is normally used for tubing leak-proofness is generally 0.02 to 0.035millimeter thick. This thickness depends strongly on the tension applied on the ends of the ribbon. Compared to the lubrication used by Manfrotto, it is physically a quasi-solid material and it has similar low friction characteristics by nature. (3 +1/3) revolutions around the first cylindrical surface of part #3 and (3+2/3) on the other have done the trick on my own MA300. The interstices were completely filled as required. The number of turns may depend on the specific value of slack for another MA300 model. 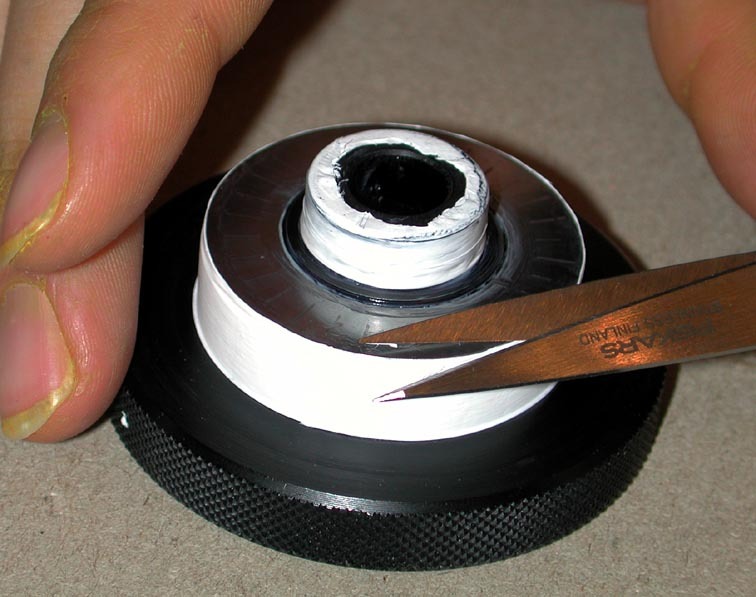 Turn the shaft while putting low tension in the Teflon® tape. Get rid of the part of the tape that is in excess. After mounting back all the parts, I then verified that the repetition error is reduced to practically naught. The manual rotation is at least as silky as it was before. The tension in the sping on the ball is rather constant and equally effective over the revolution. The slit width of "slack#2" became quasi-uniform all around the inner barrel (2): The detent ball-screw cannot scratch the inner barrel anymore. As this has been so successful to cure the slack in the rotation of the MA300. I have applied the same for the other axis of rotation of my home-made panoramic head. Here is a QuickTime Movie (700kB) or a QuickTime Object (700kB). It is built mainly from 6mm thick aluminum sheet. 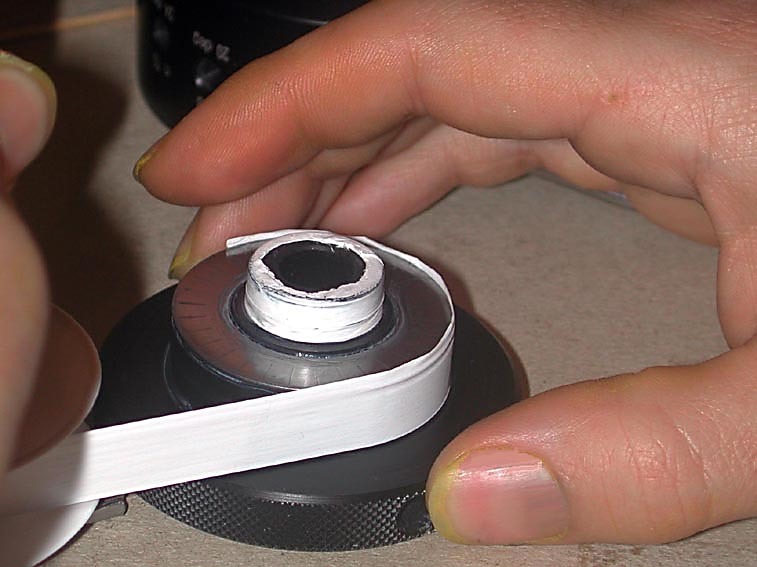 The second (to MA300's) axis of rotation has became slack free when some teflon® tape was generously applied around it. Crushing the teflon in the course of mounting back the shaft and washer allowed not only to suppress looseness on rotation but also removed any longitudinal slack between the shaft and the retainer washer as well. The easy-to-do modifications that I have described hereabove may be also applied on a panohead of different manufacturer such as KAIDAN, I assume. Subsequent tests have shown a dramatic improvement in the repeatability of angular positionning. Using a carefully pre-determined PTools script yielded systematic perceptive error free panoramas. For a 10800pixels wide panorama made from stitching three rows of eight pictures, the position error is now limited to less than two pixels horizontally and vertically. These errors are of the same order of magnitude as for manual dedicated stitching.